This question plagues many people. Apart from a “for the food chain” answer, there is something else we must remember. Originally mosquitoes would have grazed the green pastures of Eden, eating grass—just like the lion, pelican and naked hermit crabs (with no dead shells to live in they were naked, but felt no shame). 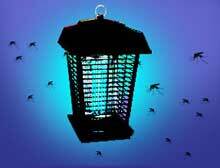 The original mosquitoes flew in flocks of four and were made with the intention of providing a soothing quartet of harmony to your ear as you walked through a garden or even for times when one wanted to fall asleep. Now obviously, and sadly, with the departure from Eden, a sudden change in these once glorious garnishes of creation took place. All that remains now are rude, presumptuous soloists, which you can hear on many summer nights, whining out their monotonic “Wiiiiiiiiiiiiiiiiiiiiiiiiiiiiiiiiiiiiiiiii,” like a one-armed person playing a one-string violin. Also on the topic, it is noted in Genesis that Noah spent quite some time in the ark before the door was opened and all the animals were released to begin their speed dating and multiplying all over the earth. The duration Noah spent in the ark after the rains stopped has traditionally been thought to have been due to the water taking a long time to receed. Not necessarily. I think it’s quite reasonable to assume Noah and Co were actually spending all that time hunting down the two mozzies on board. While lying in bed at night, locked up in the ark, Noah couldn’t just pull out the Mortein to spray a “pssssst” to send them to their spiralling death. We would have lost all manner of nice bugs (such as the lady bug, butterfly and . . . um . . . er . . . I’ll get back to you on any others)! If he could just squish the female, then he knew all of humanity would never again have to hide under a sheet, in the tropical humidity of one’s breath, on a summer night’s flyby. As we all know, after some months, the search was called off (I hear the armadillos were cranky for running out of moisturiser) and the door was opened. And to this day we have Solo Mosquitoes. - Lord Save me! Help! - I'm caught in sea weed, get me out, I’m finished.